Heritage House frequently ships to small and large retail operations, often creating branded items for resale. 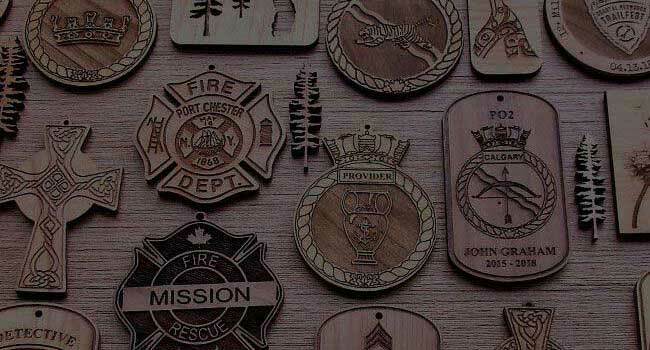 Jewelry, coasters, fridge magnets, dog tags are popular wholesale items. Everything that Heritage House creates can be customized to your specifications. Many of our interesting projects have been promotional items designed and branded for corporations as either giveaways (keychains, fridge magnets, cell phone holders etc) or actual business supplies (branded coasters, keg toppers, bottle openers, book markers). Come to us with any ideas you have we'd be happy to help! One of the most rewarding work we do is for service associations and private clubs. Retired and active military and police are justifiably proud of their life's work and we've supplied crests and emblems to many retirement parties, international symposiums and special events. Our products are unusual and get talked about for years afterwards!